With a name that translates to ‘powdered tea,’ many first-time drinkers aren’t sure what to make of matcha. Unlike other green teas that come in tea bags, matcha must be dissolved in water - leaves and all. To drink this traditional Japanese beverage, matcha tea leaves are ground into a fine powder and added to steaming hot water in a shallow bowl. The powder is then whisked into a jade-green froth with a bamboo brush and drunk immediately. This unique tea does more than give you a different flavor experience than regular tea, though. Matcha green tea benefits come because the tea bushes are shaded from the sun for their last few weeks of growth. This creates a deeper green color in the leaves because their chlorophyll content increases. Naturally, this increases the tea’s antioxidant content and flavor profile to the point that matcha has a more profound flavor and rich umami taste. Thanks to its gorgeous color and robust health qualities matcha tea is a favorite ingredient to add to lattes, smoothies, and even baked goods. No matter how you prefer to enjoy it, incorporating matcha tea into your life will provide plenty of benefits. The history of matcha tea begins with China, specifically during the Tang dynasty. Green tea leaves were powdered and dried into bricks so they can be used easily. To brew a cup, a small piece of it is broken off and stirred into a cup of hot water. Green tea was too delicious to stay as a Chinese secret. In the 1100s, the idea of the drink was brought by a Japanese monk to his home and then it quickly took off. Eventually, powdered tea became more popular in Japan than China, But only royal and highly revered samurai soldiers were allowed to drink it due to its high cost. Eventually, Japan’s passion for matcha green tea health benefits and flavor led to the development of the tea ceremony, a ritualized event enjoyed by the highest levels of society, and the perfect precursor for an afternoon of meditation. Today, matcha tea is celebrated around the world for its incredible health benefits. Should you add this ancient tea to your daily routine? These facts might convince you so. Because you drink the entire leaf in a cup of matcha, it’s hardly surprising that the resulting brew is flush with far more vitamins and minerals than other forms of tea. However, the truth about just how healthy matcha really is might surprise you. One cup of matcha provides 32 grams of caffeine, which is three times as much as a regular cup of green tea and half of a small cup of coffee. This means that matcha might be what you need to wake up in the mornings and start your day feeling alert, but not jittery. Matcha green tea benefits include a generous dose of L-Theanine, which is responsible for producing dopamine and serotonin, two chemicals that naturally improve your mood, enhance your memory, and even make it easier to concentrate on essential tasks. L-Theanine in green tea can also stimulate alpha brain waves, which are known for slowing down your brain functioning in ways that increase your focus and concentration. Unlike a cup of coffee that can leave you feeling jittery, matcha tea is renowned for promoting an ‘alert calm’ in drinkers, thanks to the amino acid l-theanine. This causes the tea’s caffeine content to be absorbed slower than other kinds of caffeine, giving you the benefits for hours without risk of overdoing it. These characteristics made matcha tea an invaluable drink in medieval Japan for all-afternoon meditation sessions that required participants to be both calm and alert. If you thought all antioxidants were created equal, think again. Matcha is filled to the brim with catechins, which are the most beneficial and most potent antioxidants available. One type of catechin, called the epigallocatechin gallate (EGCG), comprises 60% of the catechins found in matcha green tea and is renowned for its cancer-fighting properties. In fact, matcha has more than 100 times the EGCG level of other tea varieties. But the antioxidant benefits of matcha don’t end there. Matcha green tea benefits your body by providing ten times the amount of antioxidants in a cup of regular green tea. This jade green drink beats almost every superfood in regards to antioxidants, containing eight times more per serving than goji berries, 16 times more than blueberries, and 130 times more than spinach. High concentrations of EGCG in matcha mean that this unassuming tea can increase the rate at which fat is burned as well as decrease the formation of new fat cells. This is because matcha can boost your metabolism, which is your body’s rate of burning calories each day. This means starting your day with matcha might make your workouts more effective. Drinking matcha green tea is proven to be healthy for your heart. Research from the American Journal of Clinical Nutrition shows that catechins in green tea can lower your LDL (bad) cholesterol, and it can also decrease your risk of suffering a stroke. Because matcha tea leaves spend their last few weeks growing under shade cloth, they create an increased amount of chlorophyll. Research is still being conducted about the benefits of this material for human health, but some doctors believe it can help the body eliminate heavy metals and other toxic buildups. Samurai soldiers once relied on a cup of matcha before they entered battle in Medieval Japan to calm their nerves, and you can get those same matcha green tea benefits today. All green tea contains caffeine, but matcha caffeine is released in your body in a slower, more stable way, allowing you to experience an increase in alertness and physical stamina for up to six hours after you drink it. Matcha green tea’s health benefits mean that all those antioxidants are available to help support your skin health by reducing inflammation and preventing the development of damaging free radicals that lead to aging skin. This is why our Green Tea Facial Scrub & Detox Mask both contain Matcha and very few other ingredients! Th catechins found in Matcha tea have robust antibiotic properties, which means they actively promote overall health and strengthen the immune system. A single bowl of matcha can fill you with ample amounts of potassium, vitamins C and A, iron, and calcium. All matcha is not created equal. The quality of matcha you buy makes all the difference in the health benefits that you get from it. Most matcha today is grown in China and Japan, and some are cultivated in contaminated soil that can contain toxic metals like lead. 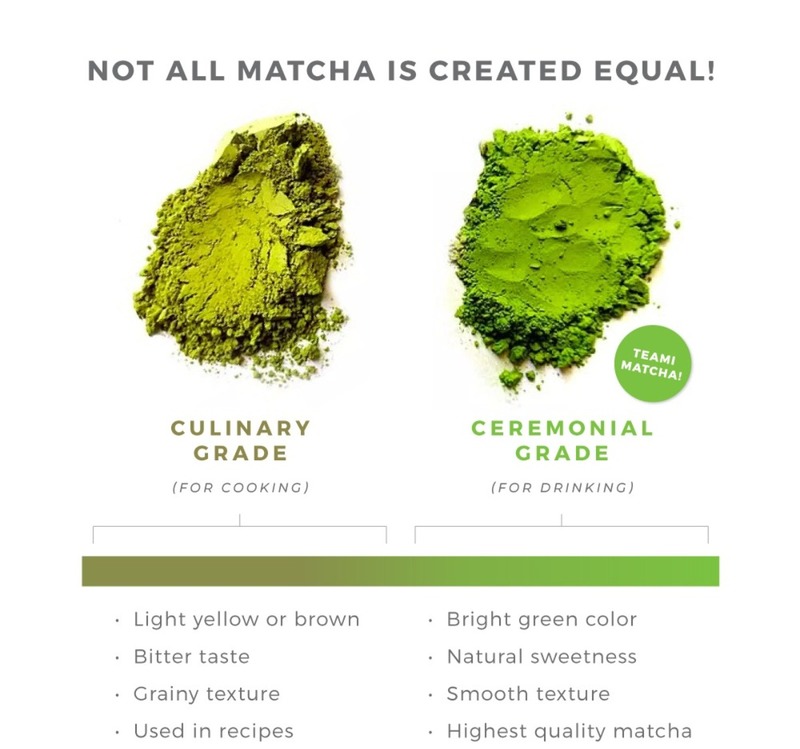 For this reason, it’s crucial to buy your matcha from a reputable source so that you know exactly what is in it. Buying organic is even better, as it ensures you get a product that is free from synthetic pesticides and didn’t pollute the planet as it grew. At Teami Blends, we believe in serving you only the best matcha tea on the market, which is why we are proud to sell Teami Matcha. This organic, USDA Certified Japanese green tea is of the highest quality, healthy, and delicious drunk hot, added to smoothies or mixed into your favorite baking recipe. Try Teami Matcha for yourself, and you’ll soon understand why this special drink has been celebrated throughout Japan for so many centuries. Dont forget a matcha teaspoon, strainer, and whisk!